In June this year, the government plus Socialdemokratiet and Dansk Folkeparti put forward proposals to tighten up the criteria for Danish citizenship. 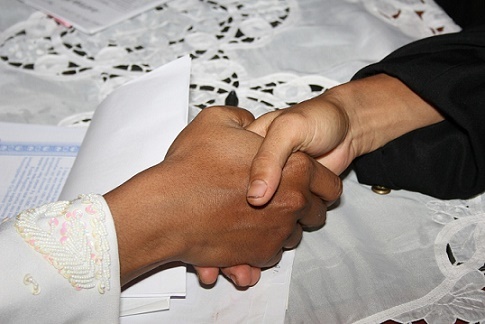 One of the measures supported by Venstre, Liberal Alliance and Dansk Folkeparti is that budding citizens will have to take part in a special ceremony during which “in connection with the ceremony, one or more representatives from the municipality meet the person and exchange a handshake”. Two mayors, both members of Socialdemokratiet, have already said they do not intend to follow the law if it is passed, reports Jyllands-Posten. Ole Bjørstorp from Ishøj and Steeen Christiansen from Albertslund both feel the demand is unreasonable and unconstitutional. “I’m obliged to take into consideration the fact that we have freedom of religion in Denmark and that is the decisive factor for me,” said Bjørstorp. Critics have pointed out that the law is yet another dig specifically at Muslims, some of whom cannot shake hands for religious reasons but greet each other by placing a hand on their heart. They have also questioned whether the act of shaking hands can really be considered a fundamental Danish value, as Dansk Folkeparti claims. Christoffer Badse, the head of monitoring for the Institute for Human Rights, told Jyllands-Posten that he thinks the demand is contrary to human rights and freedom of religion. News in Digest: Intolerant request or a fair shake?